Second in a series during EXhomosexual awareness month highlighting the continued challenges faced by EXhomosexual Americans. Homosexual activists are a textbook example of circular hypocrisy. Their grandstanding requires that they lie so much they have long lost the realization of the vicious cycle of their lies. Then again, history has a regressive way of repeating itself. The times may change, but the tactics of hate remain the same. Case in point, two EXGLBT advocacy organizations declared July as “Exgay Pride Month” and consequently planned a celebration event to highlight the contributions and ongoing struggles of American citizens who are EXhomosexual. They made no demands on the gay community and asked nothing of them. In fact this was just a group of people who felt the need to encourage themselves and their families. Fair enough? Nope, not for homosexual activists. The announcement set off a frenzy of attacks. From the Boston Edge to jittery RightWingWatch, the online gay allied world exploded with numerous reports, blogs and oped peices about the event. Even NBC News mentioned it! The stories were jammed with missiles named mockery, condemnation, bullying, discrimination, judging, unwarranted name calling, bigotry, intolerance and all the detestable vices homosexuals claim have no place in a fair and equal America. But it became very clear that in the eyes of homosexuals, they are the only ones who can simultaneously engage in such vicious behavior while at the same time pretending to decry it. 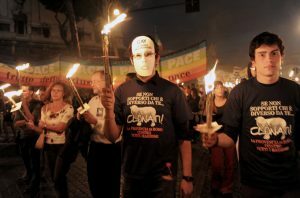 This entry was posted in Uncategorized and tagged ex-gay pride month, EXGLBT, Exhomosexual awareness event, Gay Activists React Klan-style, homosexual activists on 2013-07-16 by VoV Contributor.